14 x 14 x 6 Inch with 1.5 Inch Trim - SHIPS FREE! The Physio-Control Recessed AED Cabinet with Alarm is designed to be able to house many different AEDs including the LIFEPAK 500, LIFEPAK 1000, LIFEPAK CR Plus, and LIFEPAK Express defibrillators. It is a recessed cabinet, meaning that it is designed to sit back flush into the wall, rather than sticking out in an obtrusive manner. This is especially useful to reduce the potential hazard of running into or hitting one's head on a cabinet that sticks out several inches. As such facilities with high risk individuals would probably prefer to have this cabinet over a surface mount or only partially recessed style. 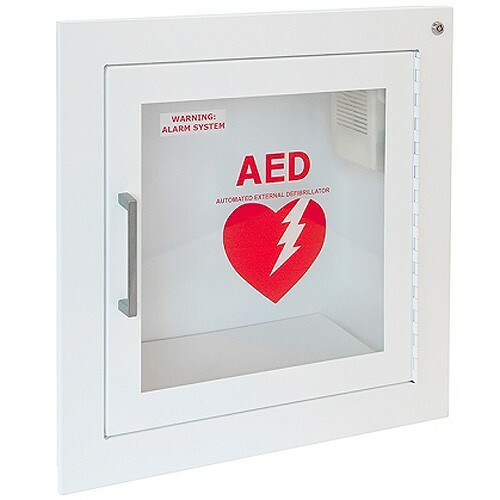 A Cabinet such as this is the perfect item for storing your AED in a highly visible, highly accessible location. AEDs should be easy to see and access in an emergency, so generally the doors are non-locking and instead they have an automated alarm that triggers for the dual purpose of theft deterrent and also creating awareness that there may be an emergency occurring so first responders need to act quickly. Optionally you can also purchase a strobe light alarm accessory that sits above the and activates upon opening the cabinet. These are very bright and so are useful in very loud environments where the built in auditory alarm maybe wouldn't be heard. Physio-Control AED Cabinets are built with durability, quality, and security in mind. The glass front is clearly labeled and also enables a clear view of the device inside. This ensures that potential life-savers are aware of exactly what is in the cabinet well before they ever need to open it. The cabinet is constructed with steel and given an attractive white finish. This model includes a built in auditory alarm that activates upon the opening of the cabinet door.